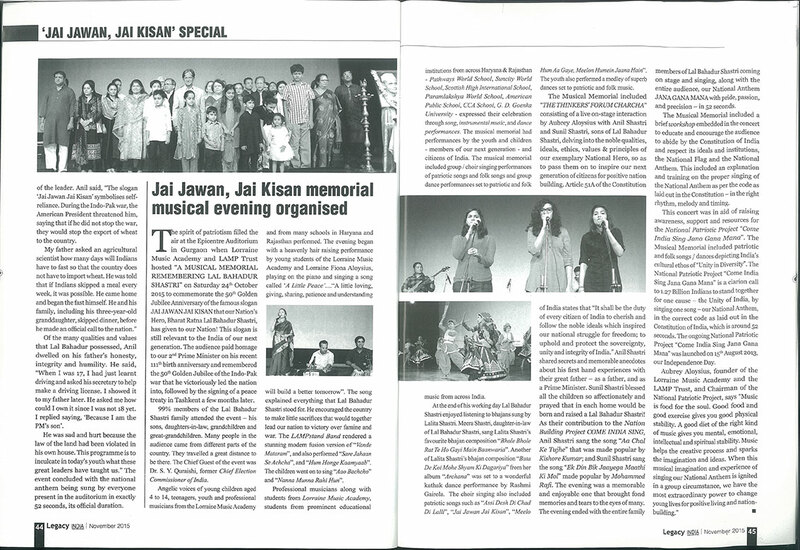 The spirit of patriotism filled the air at the Epicentre Auditorium in Gurgaon when Lorraine Music Academy and LAMP Trust hosted “A MUSICAL MEMORIAL REMEMBERING LAL BAHADUR SHASTRI” on Saturday 24th October 2015 to commemorate the 50th Golden Jubilee Anniversary of the famous slogan JAI JAWAN JAI KISAN that our Nation’s Hero, Bharat Ratna Lal Bahadur Shastri, has given to our Nation! This slogan is still relevant to the India of our next generation. The audience paid homage to our 2nd Prime Minister on his recent 111th birth anniversary and remembered the 50th Golden Jubilee of the Indo-Pak war that he victoriously led the nation into, followed by the signing of a peace treaty in Tashkent a few months later. 99% members of the Lal Bahadur Shastri family attended the event – his sons, daughters-in-law, grandchildren and great-grandchildren. Many people in the audience came from different parts of the country. They travelled a great distance to be there. The Chief Guest of the event was Dr. S. Y. Quraishi, former Chief Election Commissioner of India. Angelic voices of young children aged 4 to 14, teenagers, youth and professional musicians from the Lorraine Music Academy and from many schools in Haryana and Rajasthan performed. The evening began with a heavenly hair raising performance by young students of the Lorraine Music Academy and Lorraine Fiona Aloysius, playing on the piano and singing a song called ‘A Little Peace’….“A little loving, giving, sharing, patience and understanding will build a better tomorrow”. The song explained everything that Lal Bahadur Shastri stood for. He encouraged the country to make little sacrifices that would together lead our nation to victory over famine and war. The LAMPstand Band rendered a stunning modern fusion version of “Vande Mataram”, and also performed “Sare Jahaan Se Achcha”, and “Hum Honge Kaamyaab”. The children went on to sing “Aao Bachcho” and “Nanna Munna Rahi Hun”. Professional musicians along with students from Lorraine Music Academy, students from prominent educational institutions from across Haryana & Rajasthan – Pathways World School, Suncity World School, Scottish High International School, Paramlakshya World School, American Public School, CCA School, G. D. Goenka University – expressed their celebration through song, instrumental music, and dance performances. The musical memorial had performances by the youth and children – members of our next generation – and citizens of India. The musical memorial included group / choir singing performances of patriotic songs and folk songs and group dance performances set to patriotic and folk music from across India. At the end of his working day Lal Bahadur Shastri enjoyed listening to bhajans sung by Lalita Shastri. Meera Shastri, daughter-in-law of Lal Bahadur Shastri, sang Lalita Shastri’s favourite bhajan composition “Bhole Bhole Rat Te Ho Gayi Main Baanwaria”. Another of Lalita Shastri’s bhajan composition “Bata De Koi Mohe Shyam Ki Dagariya” from her album “Archana” was set to a wonderful kathak dance performance by Rashmi Gairola. The choir singing also included patriotic songs such as “Assi Desh Di Chad Di Lalli”, “Jai Jawan Jai Kisan”, “Meelo Hum Aa Gaye, Meelon Humein Jaana Hain”. The youth also performed a medley of superb dances set to patriotic and folk music. The Musical Memorial included “THE THINKERS’ FORUM CHARCHA” consisting of a live on-stage interaction by Aubrey Aloysius with Anil Shastri and Sunil Shastri, sons of Lal Bahadur Shastri, delving into the noble qualities, ideals, ethics, values & principles of our exemplary National Hero, so as to pass them on to inspire our next generation of citizens for positive nation building. Article 51A of the Constitution of India states that “It shall be the duty of every citizen of India to cherish and follow the noble ideals which inspired our national struggle for freedom; to uphold and protect the sovereignty, unity and integrity of India.” Anil Shastri shared secrets and memorable anecdotes about his first hand experiences with their great father – as a father, and as a Prime Minister. Sunil Shastri blessed all the children so affectionately and prayed that in each home would be born and raised a Lal Bahadur Shastri! As their contribution to the Nation Building Project COME INDIA SING, Anil Shastri sang the song “Aa Chal Ke Tujhe” that was made popular by Kishore Kumar; and Sunil Shastri sang the song “Ek Din Bik Jaayega Maathi Ki Mol” made popular by Mohammed Rafi. The evening was a memorable and enjoyable one that brought fond memories and tears to the eyes of many. The evening ended with the entire family members of Lal Bahadur Shastri coming on stage and singing, along with the entire audience, our National Anthem JANA GANA MANA with pride, passion, and precision – in 52 seconds. The Musical Memorial included a brief workshop embedded in the concert to educate and encourage the audience to abide by the Constitution of India and respect its ideals and institutions, the National Flag and the National Anthem. This included an explanation and training on the proper singing of the National Anthem as per the code as laid out in the Constitution – in the right rhythm, melody and timing. This concert was in aid of raising awareness, support and resources for the National Patriotic Project “Come India Sing Jana Gana Mana”. The Musical Memorial included patriotic and folk songs / dances depicting India’s cultural ethos of “Unity in Diversity”. The National Patriotic Project “Come India Sing Jana Gana Mana” is a clarion call to 1.27 Billion Indians to stand together for one cause – the Unity of India, by singing one song – our National Anthem, in the correct code as laid out in the Constitution of India, which is around 52 seconds. The ongoing National Patriotic Project “Come India Sing Jana Gana Mana” was launched on 15th August 2013, our Independence Day.